MOST children start school when they reach five years old, but some have a much earlier introduction. These are the children who go to Nursery schools, designed for infants from two to five. No lessons are taught a child before it is five, but children who have already learned to mix with others and to experiment on their own take more easily to normal school life. There are experts who aim at the ideal of sufficient nursery schools for all the children who want to go to them. Such schools have a definite place in the educational scheme but lack of accommodation at present, rules that in the majority of nur¬series, it is largely emergency cases which are admitted. These schools were started between the wars but conditions resulting from the last war have made the need for more nurseries an urgent matter. The pattern of life in one nursery school does not vary very much in principle from that in another. I recently visited one, in the town area of Harlescott, Shrewsbury and another in one of the country areas at Hodnet. I will deal with Harlescott in a future article. At Hodnet Nursery school, the children come from an area which includes Market Drayton, Wem, Shawbury, Clive and Stanton and the mothers of most of them are either at work or have such responsibility in the way of large families and inability to afford help to cope with them. The headmistress is Miss A. V. Rowlands who was formerly an art teacher at the Birmingham Municipal School of Art. During the recent war she was a Staff Communi¬cations officer in the Fire Service. After this she was on clinical work in a nursery in her home town of Burnley, Lancs. She then trained at Risley College before taking on Hodnet. Her family had been connected with Hodnet for many years before their move north and Miss Rowlands has long wanted to return. She has student assistants and on my visit I met Miss Gwen Tew who has done residential work in Shropshire schools. In charge of the cooking is Mrs. H. Owen. 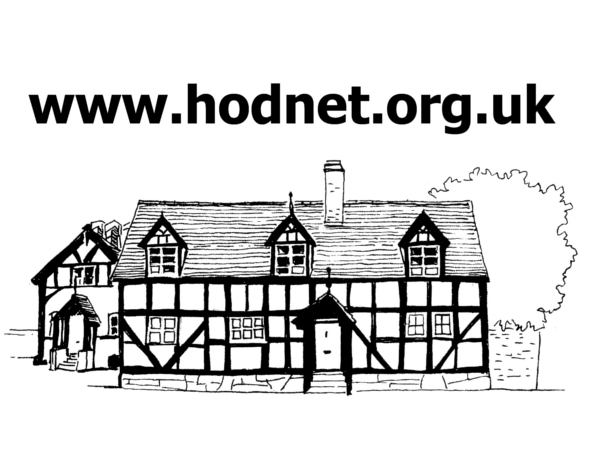 Hodnet was originally built as a private nursery in black and white to blend with the rest of this delightful village. It was given to the council for its present use. It stands in a fair sized garden and keeps itself in produce. In summer, the children spend almost all their time outside. Their routine is adapted to this. A large rubber dinghy is filled with water and they use this as a paddling pool. The nursery provides the children with sunsuits, which are kept in the first aid cupboard. Another outdoor activity of the children is nature. They have their own nature corner in the nursery with an aquarium tank, a weather chart and various wall illustrations of the seasons and months. Here, they can bring their finds for display. There is a flexible daily programme of activities. The children arrive between nine and nine thirty in the morning. Group Play, which means that they can play with what they like, follows. At 10-15 cod liver oil and orange juice appears and after this is a teeth-cleaning session in the bathroom. The children then split into three age groups. Activities then vary from day to day. They include saying nursery rhymes, acting rhymes in the puppet theatre, percussion band, nature, learning easy songs or dances or listening to a story. Miss Rowlands herself is particularly inter¬ested in ballet dancing and the children are told the stories of the Sleeping Princess and others. This is a more educational form of play. Naturally, a very keen interest with Miss Rowlands is art. She has done much painting in the Lake District and hopes do more down in Shropshire. The children have an art room where they paint or make cut-out paper patterns or model in clay. 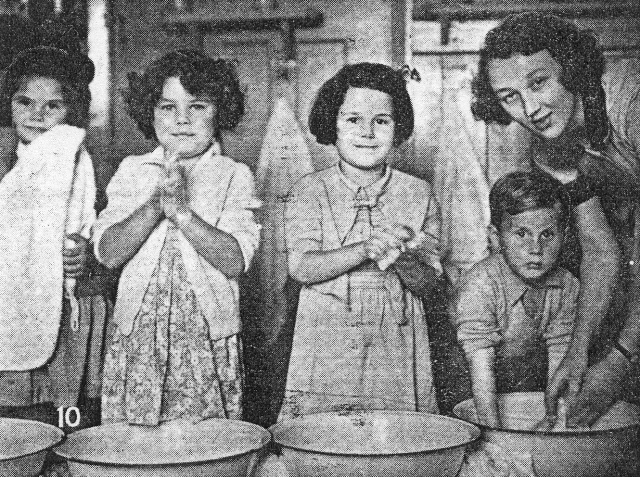 There is a big bath of soft clay and they are given rubber working aprons to wear while they work with it. The children enjoy this and it is “creative” play. The development of the child is very easily watched by their progress in this field. After half an hour, the children get ready for their midday dinner. While waiting, they frequently amuse themselves with picture books from the library corner. Miss Rowlands likes books and pictures’ for the children to be tastefully coloured and she collects suitable pictures from magazines and binds them into books for the corner. After the meal, the younger children lie down and the older ones play in another part of the nursery, with educational toys. These are mainly puzzles ranging in difficulty from a box with differently shaped holes into which the child must drop the cor¬rectly shaped blocks, to more intricate things such as jig saw puzzles. Whenever the weather permits, the children play outside. Christmas is a great time at Hodnet. Miss Rowlands herself really loves the season and thinks up ideas for it months in advance. The nursery is decorated in as many novel ways as she can imagine. A big Christmas tree is illuminated with fairy lights and the usual ornaments, and at the children’s party Father Christmas is present to be told exactly what every-one wants. His arrival was spectacular one year for Miss Rowlands hid him in the cupboard and while the children were letting off steam in one part of the nursery, quietly installed him behind the Punch and Judy Theatre. At the right moment, the owner of the cottage opposite the school clanged some large brass bells outside her door and when the children appeared to see what was happen¬ing, it really did seem as if a magic sleigh had come along that way and gone. I left Hodnet feeling that much useful work was being done there. Toddlers were happy. Their minds are learning to explore. They were learning how to get along with their fellows and some of the older ones were beginning to look forward to the days when they could go to the “proper” schools and find out what goes on there. Sliding down a chute is a very nice way to amuse yourself out of doors. There are lots more toys to play with if you don’t like these ideas. What will happen next! An eager crowd watch the puppet theatre. This is a very enjoyable way to spend a hot afternoon. Educational play with a picture book is outside too, in Summer. You can’t delay over dinner when you’ve so much to do-and anyway it’s always a matter for extreme concentration. After lunch the smaller ones have a rest, nicely tucked up. Painting is a Great Game. Girls seem to like getting clean. The boy seems rather serious about it. N.B. This article was taken from the pages of a magazine, however there was no record of which publication or the date of publication. If anyone can provide more details please let the web team known.